Today, McDonald Building Company celebrated the groundbreaking of Beech Street Factory, a former furniture manufacturing facility that will soon transition into 43 comfortable, sustainable, and affordable urban loft apartments and artist hub. Originally built in 1912, this massive brick warehouse complex first served as the Leibowitz Shirt Factory, then the Fecera’s furniture warehouse, and now this deteriorating structure that has been in need of a revival will see a new day. The project calls for the rehabilitation of the 60,000 sq. ft. site and structures into mixed-use residential geared towards local artists and features ADA-accessible commercial space that will serve ArtFusion 19464, a local non-profit art school and gallery. Sustainable highlights include EnergySTAR appliances and water-conserving initiatives to keep the residents’ utility bills at a minimum. 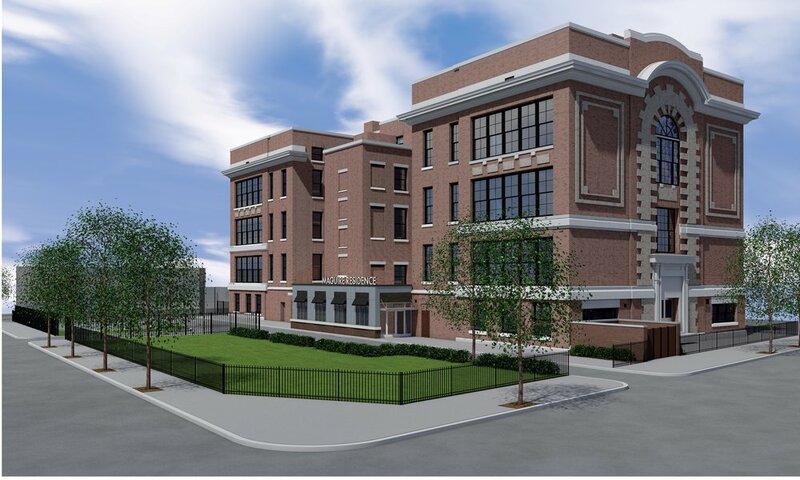 The large windows and historic character of this building only enhance the overall site developments including landscaped parking lots, a new central open air courtyard and other amenities such as gallery space, leasing offices, and a community room. The Pennsylvania Housing & Finance Agency (PHFA) is providing a $1.1 million low-income housing tax credit towards the project and additional funding is being provided by Montgomery County and Enterprise Community Investment among others. Congratulations to Housing Visions and Genesis Housing Corporation on the long-awaited start to this exciting project. MBC is excited to be a part of this visionary project and the revitalization of this area of Pottstown. Barton Partners is the Architect of Record and construction is expected to take about a year and complete by early 2017. Click here to view renderings of this project and more info. The Honorable Tim Hennessey, PA House of Representatives, commemorating the groundbreaking with a solid wall bashing. McDonald Building Company has been named the Construction Manager for Interior Renovations and Equipment Upgrade at the Kennedy Health System IR Suite located in Washington Township, NJ. The work will primarily revolve around installing new steel and utility systems to support new Siemens radiology equipment. Features includes upgrades to the finishes and lighting in the procedure, equipment and control rooms. Finish and ceiling device upgrades will also be made to the 3 prep and recovery bays, nurses’ station, toilet rooms, and corridor within the IR Suite. Construction is anticipated to run 4 months and complete Winter 2016.